Jarvis & Associates is a small firm specialized in the fields of commercial and aviation law. We represent companies, governments and individuals world-wide in diverse, complex, commercial aviation and yacht transactions, and all aspects of litigation. 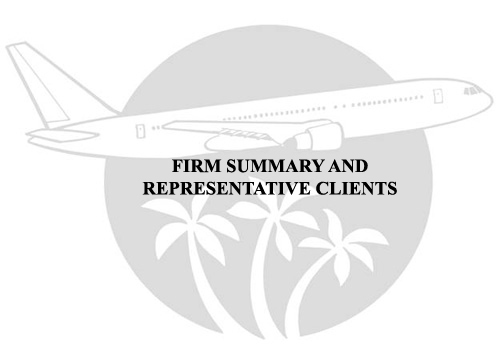 We have an extensive network in the aviation and marine industry, including governmental authorities, experts, industry consultants, and specialized associate legal counsel throughout the world to ensure our clients comprehensive global representation. Being a small firm allows all our clients to receive immediate, personal attention, and our location in Miami puts us at a major world cross-roads. James W. Jarvis is Board Certified in Aviation law by the Florida Bar Association and is a Florida Supreme Court certified circuit court and appellate mediator with forty (40) years of professional experience. Jarvis & Associates provides legal representation and counsel from negotiation to closing and subsequent administration in all aspects of the acquisition, operation, sale, leasing and financing of large transport aircraft and general aviation jet aircraft, engines, equipment, and related airport facilities along with comparable services for yachts. This area of our practice includes transactional and litigation services for financial institutions, airlines, lessors, and includes aviation industry corporate merger and acquisition structures. We also provide services to aircraft engine and overhaul facilities and maintenance and repair organizations serving both airline and private aircraft operations. Jarvis & Associates has extensive experience and expertise in aircraft registration (U.S. and worldwide) and aircraft and engine liens, mortgages, security interests, cross-border leasing, conducting attachments, repossessions, both judicial and non-judicial equipment recovery. This area of our practice includes U.S. and foreign aircraft registration, securitization and ownership and operation of U.S. registered aircraft by non-U.S. citizens and the acquisition of U.S. operating rights for foreign air carriers. With respect to yachts, similar services are provided in regard to yacht registration in various jurisdictions. Jarvis & Associates represents one of the leading thoroughbred racing and broodmare operations in the world with regard to transactions relating to all aspects of the acquisition, registration, sale, and syndication of horses and related legal issues pertaining to thoroughbreds. Jarvis & Associates represents various aircraft and equipment owners and operators, and underwriters in all aspects of insurance coverage and insurance disputes. This includes counseling and litigation arising out of aircraft hull loss and damage and the defense of sureties arising out of potential bond liability. We are also instructed by numerous domestic and London underwriters to provide representation in all aviation related insurance matters arising from contract disputes and product claims. Jarvis & Associates has an extensive, specialized, air cargo adjusting and defense program which includes complex, international, and Warsaw Convention litigation. We are licensed insurance adjusters and handle air cargo claims from first notice of loss to the air carrier, all the way through trial and appeal if legal action is instituted. This comprehensive program includes risk management and loss prevention counseling to the insured. This unique system saves underwriters on overall claims adjusting (our rates are comparable to traditional adjusting companies) and defense costs by concentrating a high volume of claims and eliminating duplication of efforts by adjusters and attorneys. It discourages inflated claims and encourages early settlement by requiring claimants to deal with attorneys immediately upon serving a notice of claim. The attorneys at Jarvis & Associates are admitted to practice before all the courts of the State of Florida, the U.S. Federal Judiciary, the U.S. Virgin Islands, Puerto Rico and certain foreign jurisdictions. We represent clients in all phases of commercial, contract and insurance litigation, including pre-trial mediation, arbitration (U.S. and foreign jurisdiction), at trial and appellate court levels. Our experience includes jurisdictional and venue disputes in actions brought in U.S. courts attempting to bring foreign governments, corporations, and foreign nationals to defend before U.S. courts. We are an established, specialized, commercial and air law organization with a strong emphasis on complex aviation equipment transactions and worldwide operation and regulation of flight equipment and similar services in the yachting and thoroughbred industries. We focus our entire attention on prompt, professional attention to a select few clients. We do this without the burden of large firm bureaucracy, impersonal treatment, and high cost.